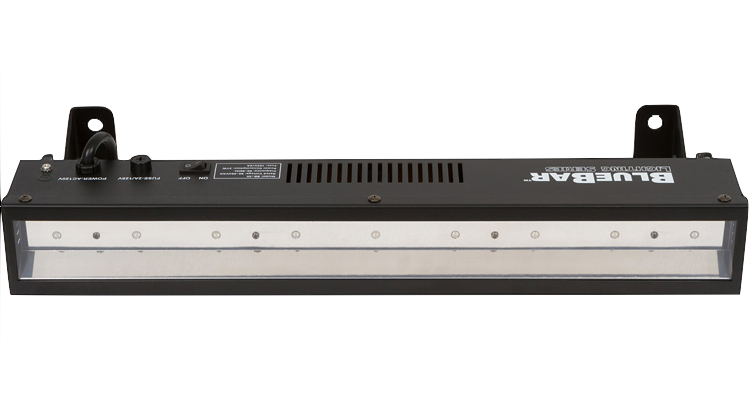 The BlueBar UV LED Lighting Series from Wildfire features nine 3W 400nm UV LED’s, universal voltage (120-277V/50-60Hz) input and polished Everbrite reflectors for improved versatility and performance. Like other 385-400nm LED black lighting products, BlueBar UV LED lighting is designed to work with visible fluorescent materials only. The BlueBar 30 offers premium quality UV LEDs, which produce more UV output, resulting in a brighter effect. At 400nm, it outshines competing 400nm UV LED products. The polished Everbrite aluminum reflector with angled sides offers more reflective surface area, greater coverage, and maximum output. It’s tough UVT (UV-Transmitting) acrylic lens cover helps protect the LEDs from flying debris or careless technicians.